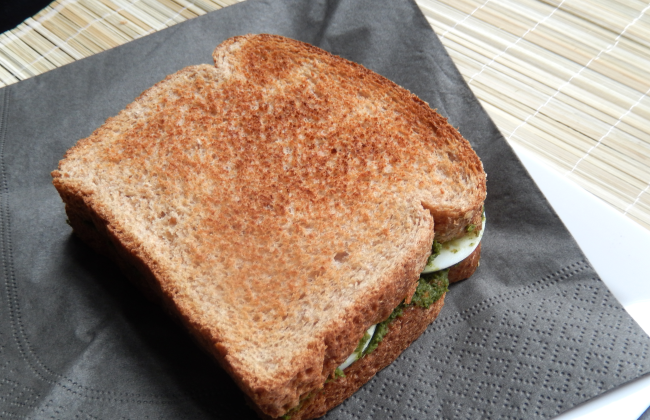 Not exactly… I mean, the eggs are not green, but the sandwich is! 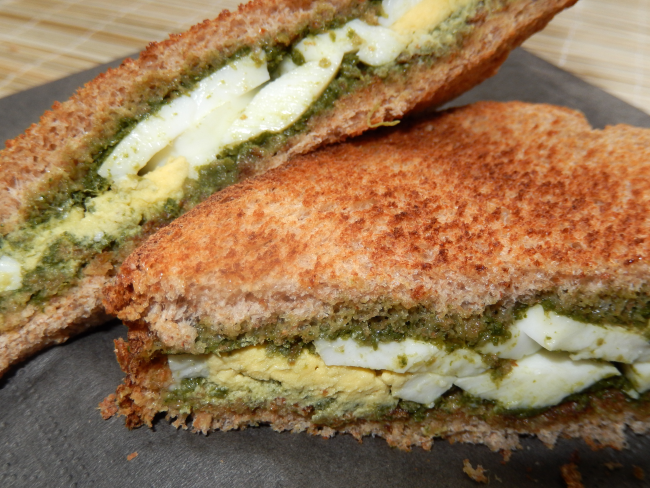 A lovely green chutney is the secret behind this delicious sandwich which can be made in a jiffy. When it comes to sandwiches, I totally agree with John Montague, the 4th Earl of Sandwich, who is credited with its creation in the first place. The story goes that reluctant to get up from the card table – apparently, the man took his gambling seriously – he would ask his servants to hand him a piece of meat between two slices of bread so that his fingers would stay clean. Naturally, the other players at the card table started asking for the food item ‘same as sandwich’ which soon got abbreviated further and the dish named sandwich was born! I have tried out a lot of combinations of fillings and flavourings for sandwiches, over time. 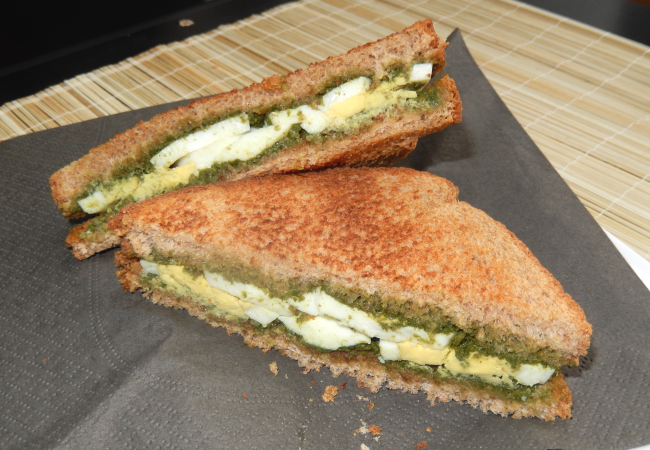 One combination that has been a great hit with many of my friends is a variation of the traditional vegetable sandwich with green chutney. 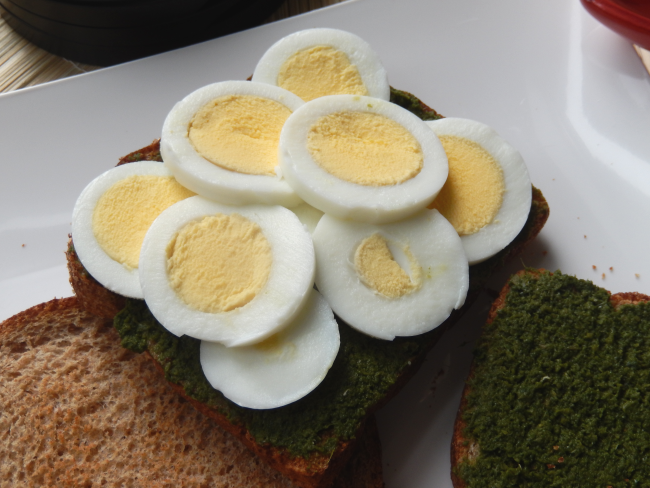 Just replace all the vegetable fillings with slices of boiled eggs, keeping the green chutney part intact. Viola, you have cut down the effort and time to less than half while ending up with a sandwich that is even more tasty! Making the chutney is the only task that takes a bit of time. Or rather getting the ingredients for the chutney together. Once you have assembled the stuff, just grind them all together and you have the chutney ready. Next comes the bread. Unless a recipe definitely calls for white bread, I go for whole wheat. Especially as that is the bread that I always have on stock. You should toast the bread slices for this sandwich as it adds to the flavour. Butter both the bread slices, on one side of course, for a sandwich before applying the chutney. The barrier of fat is required to prevent the chutney from totally soaking into the bread and making it soggy. After the butter, the chutney goes on. Rather thickly. Actually, how much chutney will depend on your preferences. Then just layer the slices of the boiled egg over the chutney on one slice of bread. I used an egg slicer to do the slicing, but it can easily be done with a knife. Place the second buttered and chutneyed bread slice over the egg and press down a bit. The chutney will hold it together well. 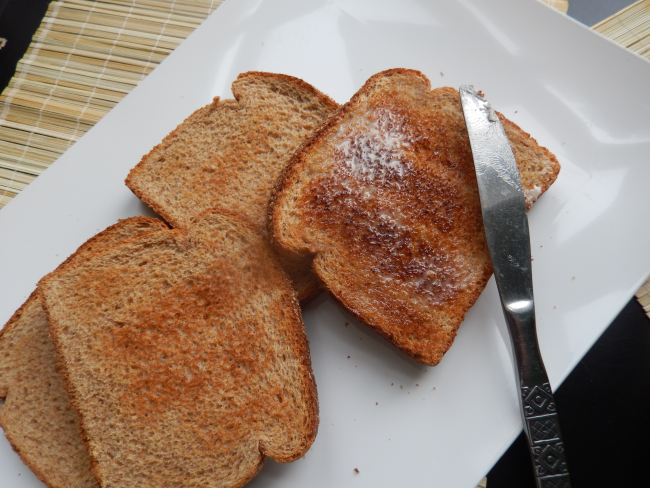 There is no need to toast the sandwich as the bread has been toasted already. As a quick lunch or snack to go, an ideal sandwich. Enjoy! 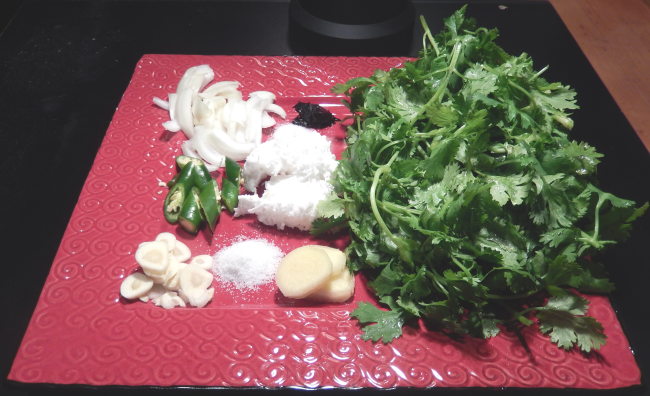 Clean the cilantro and remove all hard stems. Slice the onion into thin wedges. Slice the ginger, garlic and green chillies. 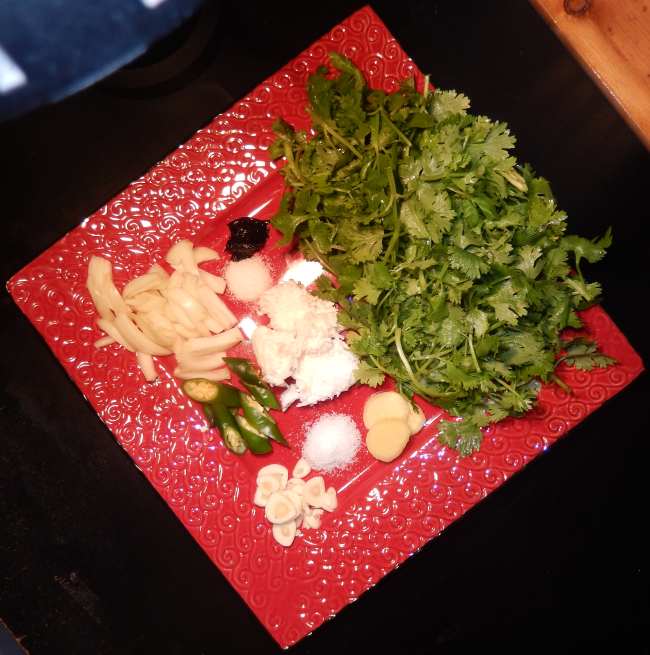 Grind together the cilantro, coconut, onion, ginger, garlic, green chillies, tamarind, sugar and salt together in a blender till smooth. If required, you can add a spoonful of water. Transfer to a dish and keep aside. Apply butter on one side each of all the bread slices. Apply chutney on the buttered side of the bread slices. Slice the boiled eggs and place the slices over the chutney. 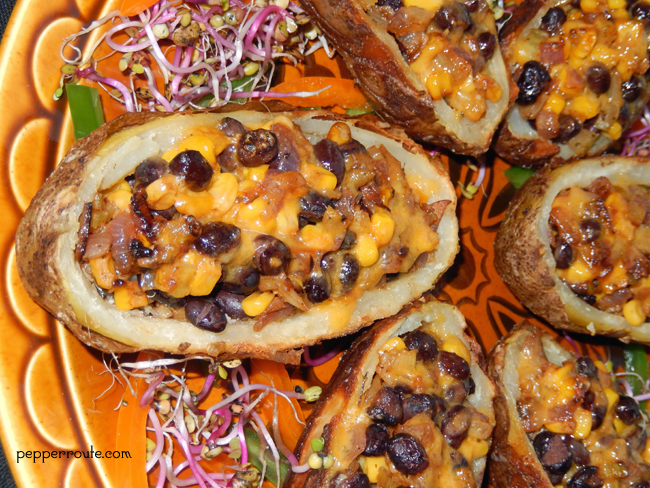 Cover with the second slice of bread and press down a bit. 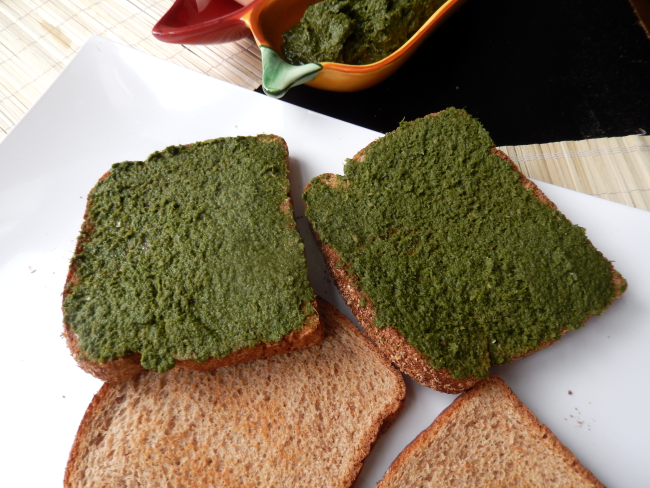 green chutney sandwiches are my absolute favorite – I lived on that stuff in college. 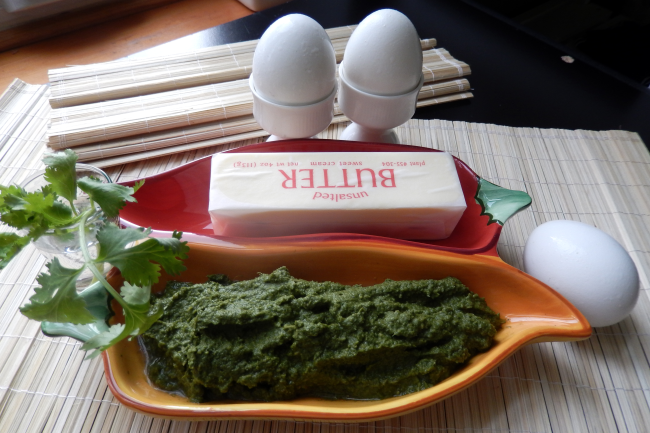 I’ve never done boiled egg with it – but it might be a great way to combine my fav sandwich with healthy protein – in any case I’m always looking to mask boiled eggs ! Slurp, just had it. What a refreshing breakfast. Thank you Velliamma.